The 62nd Cannes Film Festival was held from 13 May to 24 May 2009. French actress Isabelle Huppert was the President of the Jury. Twenty films from thirteen countries were selected to compete for the Palme d'Or. The awards were announced on 23 May. 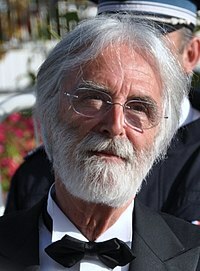 The film The White Ribbon (Das weiße Band), directed by Michael Haneke won the Palme d'Or. The festival opened with Pixar's film Up, directed by Pete Docter and Bob Peterson. This marked the first time that an animated film or a film in 3-D opened the festival. The festival closed with Coco Chanel & Igor Stravinsky directed by Jan Kounen. American director Clint Eastwood became the second recipient of the Honorary Palme d'Or, an award given to directors who had established a significant body of work without ever winning a competitive Palme d'Or. The Festival Cannes Classics places the spotlight on documentaries about cinema and restored masterworks from the past. Lawrence of Arabia (1962) David Lean USA, U.K.
Soundtrack for a Revolution (2009) Dan Sturman, Bill Guttentag USA, France, U.K.
^ "The Official 62nd Cannes Film Festival Poster". Cannes Film Festival. festival-cannes.com. 23 May 2009. Archived from the original on 20 June 2009. Retrieved 24 May 2009. ^ a b c d e f "Official Selection 2009: All the Selection". festival-cannes.fr. Archived from the original on 31 October 2013. ^ a b c "62ème Festival de Cannes". cinema-francais.fr. Retrieved 21 July 2017. ^ "Out of Competition - Opening Film - Up". festival-cannes.com. Retrieved 21 July 2017. ^ "Up To Open Festival". festival-cannes.com. Archived from the original on 20 June 2009. Retrieved 24 April 2009. ^ "Out of Competition - Closing Film - Coco Chanel & Igor Stravinsky". festival-cannes.com. Retrieved 21 July 2017. ^ "A Honorary Palme at the opening ceremony of the Festival de Cannes". Archived from the original on 24 January 2016. Retrieved 3 September 2015. ^ "All Juries 2009". festival-cannes.fr. Archived from the original on 5 October 2015. ^ Roger Ebert (15 November 1999). "Going to the movies in India". RogerEbert.com. Retrieved 26 May 2017. ^ "Retrospective 2009, Special Screenings". festival-cannes.com. Retrieved 21 July 2017. ^ "The selection of Cinéfondation". festival-cannes.com. Archived from the original on 3 September 2014. Retrieved 21 July 2017. ^ "Cannes Classics - Documentaries about Cinema". Retrieved 21 July 2017. ^ "Cannes Classics - Restored Prints". Retrieved 21 July 2017. ^ "Cinema de la Plage". festival-cannes.com. Retrieved 27 July 2017. ^ "48e Selecion de la Semaine de la Critique - 2009". archives.semainedelacritique.com. Retrieved 21 July 2017. ^ "Quinzaine 2009". quinzaine-realisateurs.com. Retrieved 22 July 2017. ^ "Awards 2009: All Awards". festival-cannes.fr. Archived from the original on 20 January 2012. ^ "FIPRESCI Awards 2009". fipresci.org. Retrieved 22 July 2017. ^ "Jury Œcuménique Palmarés 2009". cannes.juryoecumenique.org. Retrieved 22 July 2017. ^ "Cannes Film Festival Awards for 2009". imdb.com. Retrieved 22 July 2017. ^ "Association Prix François Chalais Cannes 2009". francois-chalais.fr. Retrieved 22 July 2017. Wikimedia Commons has media related to 2009 Cannes Film Festival.